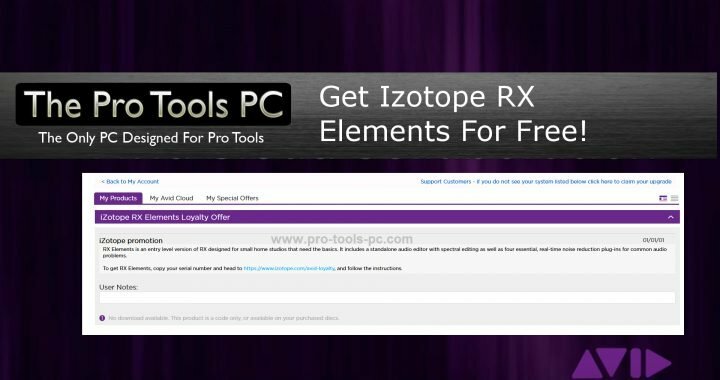 For a limited time, Izotope is offering RX Elements to any Pro Tools user with an active subscription or software update AND support plan. Check your avid account and under My Products > My Products and Subscriptions. Click on your "My Products" tab. You should see "Izotope RX Elements Loyalty Offer" Click on the link which will take you to Izotope's website. You will have to either create an account or log into your account. Step 1: Click the link below to access the download page for RX Elements. You will be asked to provide an email address in order to begin the download. Step 2: Once downloaded and installed, launch RX Elements either by using the standalone application or by loading one of the plug-ins in your host application. Step 3: When RX launches you will be asked to enter an email address and the serial number you were provided. Optionally you may also enter your iLok ID to add this license to your iLok account**. *Promotional offers valid through May 7, 2018. **A recent update to iLok License Manager may require you to update before you can use your iLok to authorize RX Elements. Download the latest version here. Don't forget to pickup TRASHER for both Mac and PC! Posted in News, Plug-Ins and tagged AAX, Free, izotope, plug-ins, Pro Tools.